If you have pet insurance with More Than, John Lewis, M&S, Argos or Tesco (four of these companies are on our list of the best pet insurers for dogs) you may have heard about a ‘preferred referral network’ of vets. That is because RSA, the underwriter of the above pet insurance providers, has created a network of vets to “help to deliver affordable pet insurance for RSA pet insurance customers”. The idea is that RSA can make sure these vets offer high-quality care, increase the treatments available and encourage vets to bill RSA directly rather than customers. The network is only used for non-emergency claims, which make up a small proportion of the claims RSA deals with and it says treatment costs for customers using the vet referral network are on average £385 cheaper than a non-network referral practice. However, it has proved controversial because RSA has also introduced a £200 charge that customers may have to pay if they have a non-emergency referral with a vet outside its network. The additional excess can be applied when there is a network vet with an hour of the customer's home and they have the capacity to treat the animal. RSA suggests pet owners should call them before the decided on non-emergency treatment so they can make a decision about the excess. If you have a policy that is underwritten by RSA you can check whether the charge affects you by looking for a line in your documents that says: "If a referral vet from outside our network is chosen, you will need to pay £200 of the referral vet bill yourself. This amount is in addition to your policy excess." Obviously, some people are not happy with the charge and a group of vets has even launched a campaign against it. It’s important to note that the vet network is only for referral treatments so you can still use your own vet for check-ups and basic procedures. And if your pet needs emergency treatment, RSA will not charge £200 if you use a vet outside its network. 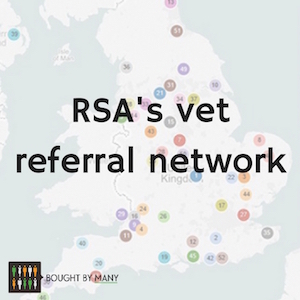 "The RSA Referral Vet Network has been established to give customers access to a trusted network of vets that provide a high standard of service and value for money. However, we do understand that in some cases where the primary vet recommends a referral practice and circumstances dictate that our nearest Network partner is not suitable, we will allow our customers to make a choice without being penalised. “If the treatment in question is covered under the policy, there will be no additional fee charged whether or not they choose to use a Network practice." So if you have a John Lewis pet insurance policy you can take your pet to any vet and you won’t have any extra costs. M&S's pet insurance is underwritten by RSA but it has not signed up to the network so its customers will not be hit with a charge for using vets outside the network. We recently launched our own unique pet insurance that is not underwritten by RSA so there are no penalties for using a vet of your choice. Find out more and get a quote here. More Than, Tesco Bank and Argos customers do have to be careful not to breach the new vet referral rules. RSA says customers are still able to choose their preferred vet, of course, that choice could incur the charge. In July 2016 it signed up another 24 vets to its network, bringing the total to 52. It says 78% of its customers should live within 60 minutes or a 60-mile drive of one of these vets. RSA announced it added more vets to its network in August 2017, bringing the total number to 58. Here’s a map of the 52 vets that made up the network in July 2016 and More Than lists their addresses and websites here. RSA aims to add more vets to the network on an invitation basis. However, the campaign group Vets For Choice says that the coverage is still not good enough. RSA says it has asked customers who have used the network what they think of it and they recorded a net promoter score of +77 for treatment and service. If you’re a More Than, Tesco or Argos customer and have any concerns about the network or excess, you should contact your insurer. You should never feel afraid to get treatment for a sick pet. Feel free to let us know what you think about the referral network on our Facebook page or on Twitter. "Very impressed with the cover - much better than my current provider overall and particularly regarding pedal cycles. Even managed to sav..."
Check out reviews of the best pet insurers with our guide to the top insurance companies for dog owners. Learn about the features of pet insurance from Tesco and whether it's right for you.